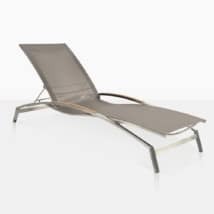 Exquisite, dignified and alluring; the Hampton Wicker Sunbed in Pebble is the ideal piece for your poolside, patio, part of the wider Hampton Collection or even on its own in the sun room! Teak Warehouse’s unique Hampton Collection is inspiring; a fabulous blend of modern fabrics in a classic design with its mix of pastel hues, soft rounded shapes, patterned wicker with just the right a touch of Hollywood Glamour. 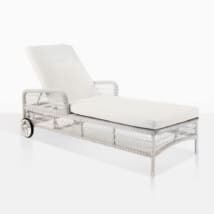 W31" x L63" x H34"
Each piece has diamond patterned wicker looped onto a solid powder coated aluminium frame, with plush cushions in a mix of solid and puckered for that star quality look. 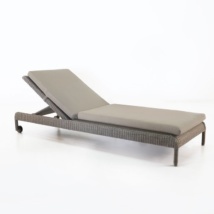 The Hampton Wicker Chaise Lounge in Pebble encapsulates all these assets! At 63 inches long and 30 inches wide get ready to can melt into this glorious double armed chaise lounge. So whether you’re after a moment of solitude or wanting to line up several for group relaxing; the Hampton Wicker Chaise Lounge in Pebble is a stunning and luxurious piece of outdoor furniture. The Hampton Wicker Chaise Lounge in Pebble is made from none other than award winning Viro® All Weather Wicker; famous for its strength and endurance against harsh elements. It is also non-toxic, UV treated and environmentally conscious so you know you have purchased something beautiful that has a long lifespan without harm. We use Sunbrella® fabric for our cushions at Teak Warehouse, because it does not fade or discolor in the sun, is easy to clean. These materials help us create a dreamy, whimsical and delightful setting without creating more work for you! At Teak Warehouse, we are honored to provide our customers with many options for outdoor living. As well as all weather wicker, we have our signature A-Grade Teak, #316 Stainless Steel, Reclaimed Teak, Raw and Blok Concrete lines, Batyline® and Textaline® Mesh and much, much more. Browse our fabulous online store for more loungers, deep seating, dining tables and chairs, umbrellas, benches and accessories; we have everything you can possibly need to turn your outdoors into an oasis of calm luxury. We arrange ship nationwide! Using a highly regarded white glove delivery service, we make sure your furniture leaves our store perfect and ends up at your home as exquisite as in the photos!! Simply call or contact us online for a quote for shipping, we will also offer information regarding time frame and handling. Have some questions? Or need a few more ideas? Our sales assistants are in store 7 days a week, please call us! We’d love to talk to you! The Hampton Collection is elegant, classic, charming and Oh-so-comfortable; inspired by seaside resorts and Hollywood glamour, you’ll feel as though you’ve taken a step into the Hamptons! Pair up the Hampton Wicker Chaise Lounge in Pebble with the sofas, loveseats and armchairs available in this collection, pair it with a matching side table or mix materials by bringing in some Reclaimed Teak or Concrete to guide it to an even more contemporary look. 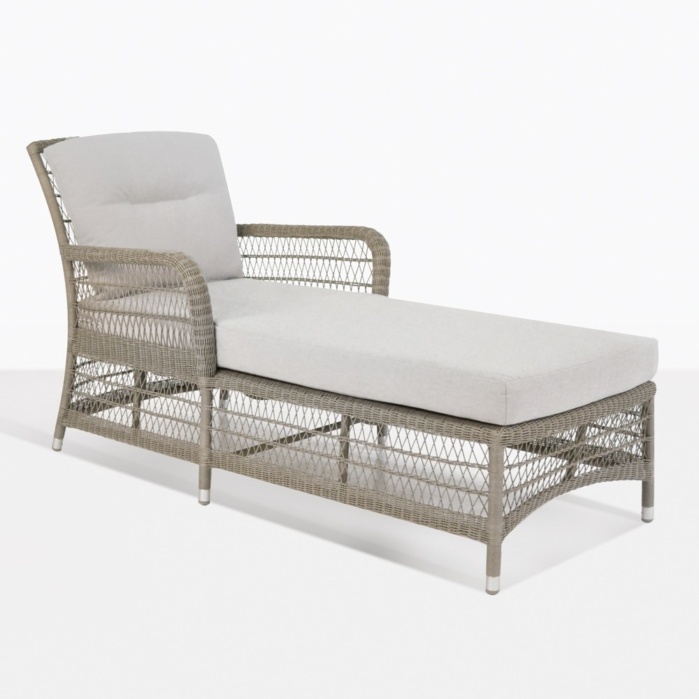 If you have a commercial property, such as a resort or hotel; try placing several Hampton Wicker Chaise Lounge in Pebble in a row with a beautiful white Sunbrella® umbrella to shade your guests in chic luxury. 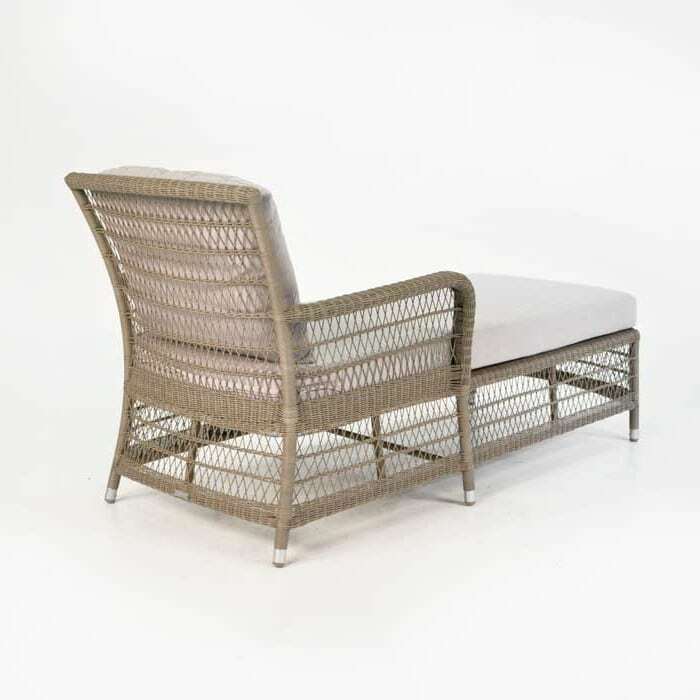 The Hampton Wicker Chaise Lounge in Pebble comes with FREE Sunbrella® cushions, and is part of our exciting new collection at Teak Warehouse. 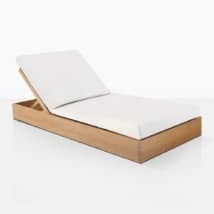 Get ready to bask in the resplendent glamour of this amazing lounger in your very own home!